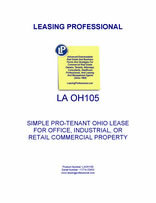 This form is for a single tenant Ohio lease where the tenant has superior leverage. It gives the tenant the right to use the premises for "any legal use," and has very abbreviated remedies for the landlord in the event of a tenant default. It is also pro-tenant in character because of the clauses it does not contain which customarily appear in pro-landlord forms relating to remedies and a variety of other pro-landlord provisions. Ohio is the seventh most populous state in the country and sits at the south of Lake Erie. Ohio is a highly industrialized state, and it also produces lime, salt and clays. Outside of Ohio’s large urban areas, there is extensive farmland. The production of hay, wheat, cattle and other items supplements the state’s industrial economy.